Turbine has revealed its June Update for Asheron's Call, and the biggest change is the introduction of a new character race known as "Gear Knights." Asheron's Call has been around for over ten years, making it one of the longest-lasting MMOGs on the market. Since Turbine took over the game's development in 2004, the studio has provided regular content updates for the game's faithful fans. The latest addition sounds particularly epic because, amongst other things, it includes a new playable race of steampunk-esque clockwork humanoids called "Gear Knights." The Gear Knights sound like an interesting race: Aside from just looking cool, they also use equipment differently than other characters do. Essentially, they don't wear armor, they absorb it into their being to become more powerful. "Gear Knights do not wear traditional armor," the race's info page explains. "Instead, they can take the pieces of armor they find and transform those pieces into Core Plating to strengthen their forms. To do this, Gear Knights use a device called the Core Plating Integrator to transform their findings into a piece of plating that covers the same locations as an armor piece. The Core Plating Integrator uses Aether magic to create the Plating, which can then be installed onto the Gear Knight in the same manner as a human might wear more conventional armor." The new race isn't the only new content coming to Asheron's Call this month. The other big addition is the launch of the Town Portal Network, which also sounds mighty spiffy. That said, I'm pretty sure players would've just been happy with getting to play as clockwork warriors. 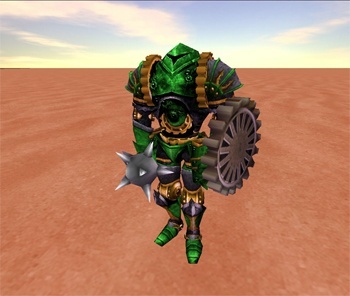 The newest playable race Gear Knights, have been added to the game. You can read the introductory fiction here, and read more about the Gear Knights functionality here. With the addition of another playable race, a new character slot has been unlocked for all players! Players now have the option of turning on Landscape Fog.